It’s a treat when hummingbirds come to visit! 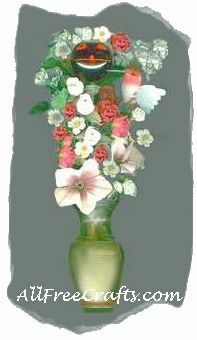 This hummingbird love meter bouquet is inexpensive and quite unique as a gift for Valentine’s Day or Mother’s Day. The photo doesn’t do the small bouquet justice; the hummingbird and his ruby-red, liquid-filled “feeder” really shine amid the flowers! But you do need a glass “love meter” from the dollar store or craft store. “Love Meter” might not be the real name for these things; they are glass ornaments filled with colored alcohol. When you hold them the red liquid boils rapidly up the glass coils, going from the larger lower bulb to a smaller collector bulb on the top. I got mine in a dollar store but similar items are available on Amazon and are known as “hand boilers”. Intermediate craft project. The glass “love meter” is very fragile and requires a gentle touch. Fill the vase with stones to weigh it down. Insert a small piece of florist’s foam into the mouth of the vase. Turn the “love meter” upside down, so that the larger globe is on top. In the middle of the love meter is an arrangement of glass coils; these may vary in shape. You need to attach the hummingbird by its wire stem to these glass coils, using your fingers to bend the wire in place. Don’t worry about visibility; the wire will be hidden by flowers. Just be careful that you don’t break the glass while you are bending the wire. If your wire is long enough you might want to just insert it in the florist’s foam instead. The object is to position the hummingbird in a hovering position near the large glass globe. Next push the love meter, small globe down, into the florist’s foam. This one had a half inch spire at the top of the globe which was completely inserted into the foam. Secure the love meter in place with hot glue at the base. Now work on positioning your flowers. Put the ivy sprig behind the bird and insert the stem into the florist’s foam. Place red and white roses through the glass coils, near the bird, and secure to the ivy with hot glue. Position the lower flowers and glue in place. That’s it – a unique Valentine gift, or an unusual Hummingbird Love Meter Bouquet for Mother’s Day!